One of the country’s most popular golf-break destinations has a new look after being rebranded as DoubleTree by Hilton Forest Pines Spa & Golf Resort. DoubleTree by Hilton Forest Pines Spa & Golf Resort – formerly Forest Pines Hotel & Golf Resort – reopened last week to welcome guests to experience its award-winning facilities and renowned hospitality. Nestled in 190 acres of beautiful north Lincolnshire woodland, in Broughton, DoubleTree by Hilton Forest Pines Spa & Golf Resort offers a 188-room hotel – operated by RBH, the UK’s leading independent hotel management company – and a multi-award-winning 27-hole championship golf course, named the “Best Golf Course in the East of England” in the 2018 Today’s Golfer Travel Awards. 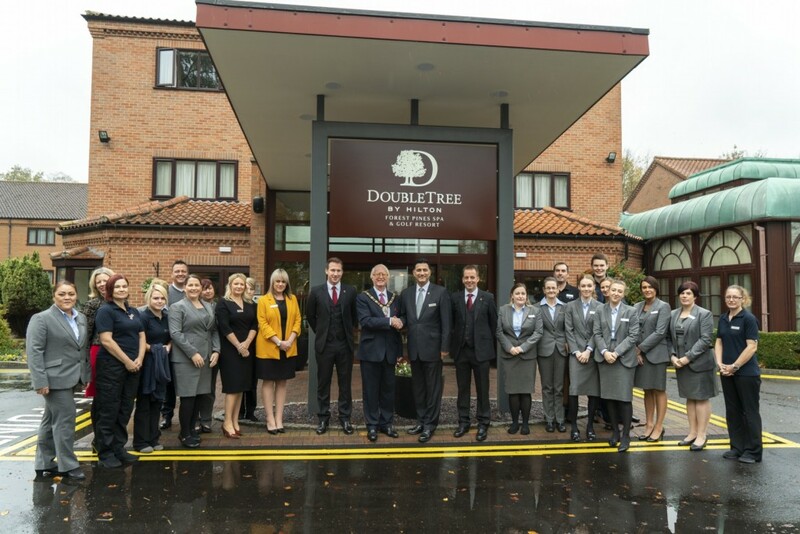 The resort is the latest addition to DoubleTree by Hilton, one of Hilton’s 15 market-leading brands, and joins an existing 50 DoubleTree by Hilton hotels in the United Kingdom. Guests can relax and unwind at the hotel’s Espa Spa and leisure centre, which offers an indoor pool, sauna, Jacuzzi and gym for those looking to re-energise. The hotel also caters for children, with an outdoor play area and seasonal games room. Michael Lavizani, general manager at DoubleTree by Hilton Forest Pines Spa & Golf Resort, said: “We are delighted to bring DoubleTree by Hilton’s renowned hospitality to the woodlands of north Lincolnshire, bringing to life new opportunities and a destination for travellers and the people of Broughton alike. Located a short distance from junction four of the M180 and nestled in 190 acres of beautiful woodland, DoubleTree by Hilton Forest Pines Spa & Golf Resort’s position makes it ideal for golfers in north Lincolnshire, Yorkshire and Humberside. DoubleTree by Hilton Forest Pines Spa & Golf Resort is part of Hilton Honors, the award-winning guest-loyalty program for Hilton’s 14 distinct hotel brands. Book direct at Hilton.com, through the Hilton Honors app, or through other official Hilton channels for more perks and a price-match guarantee. For more information, or to make a reservation, visit DoubleTree by Hilton Forest Pines Spa & Golf Resort. For news on DoubleTree by Hilton, visit newsroom.hilton.com/doubletree.